NYPD precincts in Manhattan wrote nearly twice as many tickets to cyclists in the month after the launch of Citi Bike than they issued to speeding motorists in the first five months of 2013, according to data from NYPD and the Daily News. While speed enforcement across the Manhattan and Brooklyn bike-share service area has increased this year, citations issued to cyclists outnumber speeding tickets by a wide margin. Speeding tickets comprise just a fraction of the total number of NYPD summonses issued to motorists, but the numbers show enforcement of the most dangerous violations is pitifully small compared to enforcement of violations that cause far less harm. The Daily News reported last week that officers in the 12 Manhattan precincts with Citi Bike stations issued 484 tickets to cyclists from May 27 to June 23 of this year, compared to 452 issued during the same time frame in 2012. From January through May of 2013, those precincts wrote 249 speeding tickets, and issued 109 speeding summonses during the first five months of 2012, according to data scraped from NYPD summons reports. Remarkably, the low levels of speed enforcement in 2013 represent a significant increase compared to the previous year. The Manhattan precincts in question — the 1st, 5th, 6th, 7th, 9th, 10th, 13th, 17th, 19, 20th, Midtown North, and Midtown South — issued 261 speeding tickets in all of 2012. In the four Brooklyn precincts with Citi Bike stations, plus three adjacent precincts, officers wrote 510 tickets to cyclists from May 27 to June 23 of this year, compared to 282 issued during the same period in 2012, the Daily News said. Those precincts — the 76th, 77th, 78th, 79th, 84th, 88th, and 90th — issued 719 speeding tickets from January through May of 2013. That’s up from 284 speeding citations from January through May of 2012, but is still far below the rate of bike tickets issued in June. Much of the increase in speeding enforcement can be attributed to the 77th Precinct, which issued 280 speeding tickets through May 2013, compared to 37 during the same time frame last year, and 48 speeding tickets issued in all of 2012. Speed enforcement is also up in the 79th Precinct, with 146 citations through May 2013, compared to 78 during the same period last year and 180 speeding tickets issued in 2012. The seven Brooklyn precincts cited by the Daily News issued 546 speeding tickets in all of 2012. Commissioner Ray Kelly claims there is no bike crackdown. Given the wide disparities in speeding citations, it does seem precincts have a lot of autonomy when it comes to traffic enforcement. It’s normal for cyclist stops to spike in warm weather, and it could just be that thousands of people riding conspicuous bright blue bikes are too tempting to resist. Meanwhile, motorist speeding was the leading factor in fatal crashes in 2012. According to data compiled by Streetsblog, at least 29 pedestrians and cyclists have been killed by drivers in those 12 Manhattan precincts since January 2012, and the pedestrian and cyclist death toll in the seven Brooklyn precincts during that time frame stands at 17. 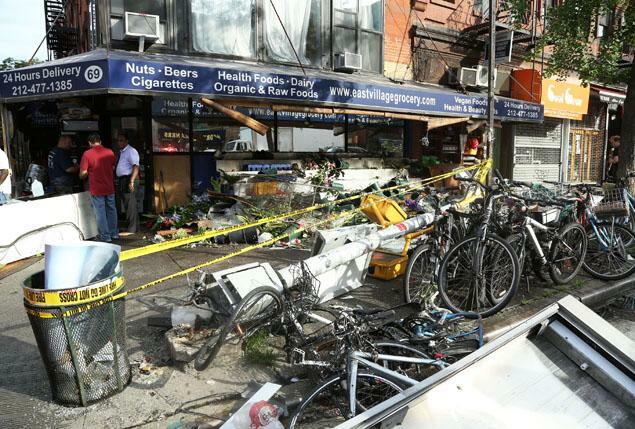 The last NYC traffic fatality caused by a cyclist occurred in 2009. Regardless of whether there is a coordinated increase in bike enforcement, the disproportionate number of tickets issued to cyclists shows NYPD is not concentrating on those responsible for injuring and killing thousands on NYC streets every year. Where can we get datasets of bike summons? I want to go to the next Fort Greene (precinct 88) meeting and complain to the chief there. I wonder if this leaves the NYPD open to being sued for equity issues.